A Gorges Quilt Care Label tells non-quilters how to care for your quilt. Photo by Barb Gorges. In business since 1998, Gorges Quilt Labels has as of 2017 distributed and sold over 97,000 labels in all 50 states, Canada, Australia and Scotland. The labels were manufactured for GQL by a company providing labels for the quality clothing and linens industry since 1938. Gorges Quilt Care Labels tell your friends and family how to take care of the beautiful quilts you made for them. Gorges Quilt Care Labels on your quilts at home protect them from well-meaning guests or family members trying to be helpful. The Gorges Quilt Care Label is taffeta ribbon sewn to the back of the quilt so that care instructions are always with the quilt and never lost. The print on a Gorges Quilt Care Label is woven in and won’t wash away like ink on printed labels. Gorges Quilt Care Labels fit basic care information into a 3-inch square so less of your quilt back is covered than by using a handwritten care label. The following information is on the back of every package. By hand: fold under top and bottom edges, including copyright, and applique all the way around the label. By machine: same as above but applique to hanging sleeve before assembly and attachment to quilt. These labels are suitable for new quilts with cotton or cotton/polyester blend surfaces and containing batting that is 100% cotton, polyester, washable wool or a polyester/cotton blend. Soap — Orvus Paste is recommended. Cut 2×4″ strips of each quilt fabric. 2. Piece strips together, alternating darks with lights. 3. Sandwich strips with batting and backing for quilt. 4. Machine quilt through all strips. 5. Treat sample according to cleaning directions. 6. If bleeding stains light fabrics, consider eliminating offending fabric. 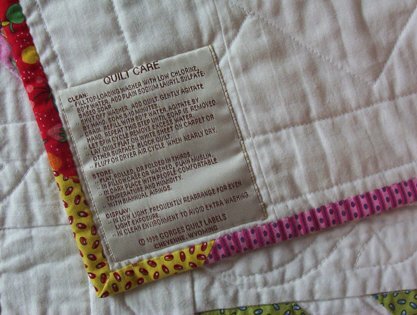 Gorges Quilt Labels is not responsible for any damage to quilts occurring from following care directions. It is the quiltmaker’s responsibility to follow testing procedures, preferably before constructing the quilt. –Flat, rolled, or folded in thirds. –In pillowcase or washed, plain muslin. –In dark place with people-comfortable temperature and humidity. –in low light. Frequently rearrange for even light exposure. –in clean environment to avoid extra washing. Gorges Quilt Care Labels have contrasting colored thread for print that is part of the weave of the sateen polyester background, with no loose threads on the back. Colors available are cream background with brown print, black with silver print, or silver with black print. Quilt Care Labels measure 3″ square, after top and bottom margins have been folded under for applique. Quilt Care Labels are suitable for new quilts with cotton or cotton/polyester blend surfaces and containing batting that is 100% cotton, polyester, washable wool or a cotton/polyester blend. Orvus Paste is recommended for washing. Gorges Quilt Care Labels are packed in 4 x 6″ zip-sealing, reuseable bags with hang holes. Each package has a cardstock insert. On the back are instructions for attaching labels, suitability and fabric testing procedures, company contact information and the UCC barcode.